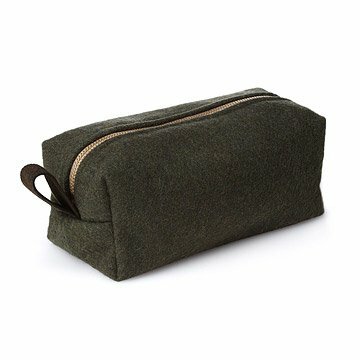 Handmade from unissued military blankets, this toiletry bag takes your grooming essentials to go in style. Handmade in Brooklyn from unissued military blankets, this sturdy toiletry bag takes your grooming essentials to go in handsome style. Designer Stacy Hauger finishes each pouch with brass zipper and d-ring for easy hanging. The interior is lined with water-resistant striped, waxed cotton for easy clean up in the event of cologne spills, deodorant disasters, and other toiletry mishaps. Stacy's work was born out of her love for all things vintage combined with a personal passion for sustainability and formal training in design. In Stacy's travels, she comes across gorgeous, inspiring vintage and sustainable fabrics, uniforms and various finds that have their own unique history that are reminders of a special place, person or time. With every piece, she decides how best to give them new life so their story can evolve and continue with you. Because of the nature of the materials she works with, every piece is truly one-of-a-kind with exceptional attention to design, detail and quality. Wipe clean with cold water only. Dry brush lining for heavy dirt. No washing machine, heat or dry cleaning. I was shocked and horrified when I opened it to show the monogrammer. The quality seems to be great but I would have checked the size closer in the description if it would have said "medium sized kit". It might hold a travel size shaving cream, tooth brush, toothpaste and small razor. Since I do not see a larger option I am scrambling to get something else and return this. I am very disappointed. I thought I had found the perfect gift. Excellently crafted and I would definitely buy again. This is a beautifully crafted and "manly" looking bag, but it is a little smaller than I expected. It would be nice to have multiple sizes to choose from. I would have bought 2 in this case. Great Gift for that Army Guy in Your Life! Really great, nostalgic appeal. My father is an "Army All The Way" guy and this was the perfect gift! The construction of the product is much better than I anticipated. Thank you!